Adire by S. Wenger and H. U. Beier. “Pattern dyeing in Indigo is a technique known to several West African tribes, notably the Sarankole of French Guinea, the Tiv of Benue region and the Yoruba of Western Nigeria. 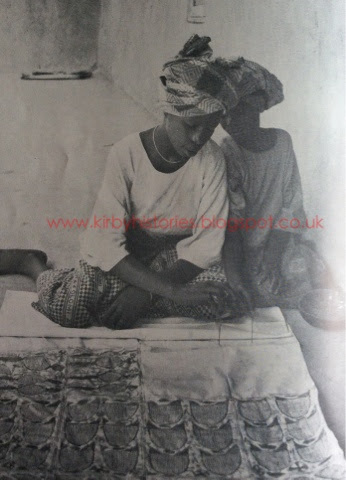 Two entirely different techniques of pattern dyeing are practised by Yoruba women. The first method consists of sewing or tying the cloth together in certain places before dyeing. In this way patches of cloth will remain untouched by the indigo vat and will appear as a white pattern on the dark blue cloth. This is the original method as the Yoruba name batik indicates. “Adire” means literally: to take, to tie and dye. The second method, which is called “adire eleko” is not older than 1910. It seems that it was first practiced in Lagos and Abeokuta . This method consists of painting a pattern in starch cloth. The starch acts as a resist to the dye, and if after dyeing the cloth is washed, the pattern again appears in white on an almost black background. The starch used for painting these patterns is cassava flour and it can be obtained in the market under the name of “lafun”. The “lafun” must be boiled together with alum to make a thick pudding. If no alum were added, the starch would dissolve in the indigo vat. The boiled starch is now called “Eko” and will be wrapped in “Ketemfe” leaves. In this way it will keep fresh for a couple of weeks, provided that the leaves are occasionally renewed. Before applying the “eko” to it the cloth must not be washed. The design is always drawn on the starchy side. To paint the pattern on cloth, a stencil may be used. Zinc or lead sheets are normally used. One of the most famous stencil pattern is the coronation “adire”, of which there are many versions. The drawing of the design is a far more laborious process when no stencil is used. The result, however, can be more alive and more attractive. Usually a woman employs a number of children who help her in drawing the design. They are trained in this way to become “aladire”. Each “adire eleko” has a special name, and each design on it also has a name. It is interesting to discover, that what seems to the stranger’s eye to be an abstract pattern, is really a representative drawing . Two of the most attractive “adire” are “eiyepe” and ” ibadandun”. The four patterns are then repeated on the right half of the cloth. Sixth line, left to right. Ambassador Ralph Uwechue dies at 80.